A classic SG now with Alnico Classic PRO pickups and coil-tapping! Epiphone honors the historic SG, one of the most original designs in rock, with the G-400 PRO, which now features Alnico Classic PRO pickups and push/pull coil-tapping. The original SG not only rivaled guitars of its own era for sonic variety but also proved to be a sign of things to come. Scores of rock, hard rock and metal guitarists embraced the original SG and made it a classic. Now, the G-400 PRO gives you the sound and look of a real SG without the vintage price tag and with the added tonal variety that you've come to expect from Epiphone. The SG Story: When the SG, or "Solid Guitar," was introduced in 1961 as a replacement for the Les Paul Standard, it was called the "fretless wonder" for its low frets and fast action. The twin horn cutaway design was like nothing on the market and its light but balanced weight made it the perfect guitar for stage and studio work. Later '60s models introduced the SG with humbucker pickups, and since then, the SG has became the go-to guitar for artists like The Who's Pete Townshend, Black Sabbath's Tony Iommi, Paul Weller, AC/DC's Angus Young, Eric Clapton and Derek Trucks of the Allman Brothers Band. Built for Classic SG Performance: The G-400 PRO is inspired by the late '60s era SGs, both a player's and collector's favorite, and uses the same dimensions and build techniques as vintage SGs made in the Kalamazoo, Michigan, factory during that classic era. The solid, tone-rich mahogany carved body gives the guitar a balanced feel on stage and in the studio (unlike cheap imitations that tend to be neck-heavy). The new Wilkinson Vintage Classic tuners are also lighter weight which makes your G-400 PRO feel perfectly balanced on stage and in the studio. The SlimTaper "D" profile mahogany neck has a 24.75" scale with 24 frets and a 12" radius for incredible reach thanks to the SG's classic cutaway. And for that one-of-a-kind SG feel, the G-400 has a rosewood fingerboard with a 1.68" nut. 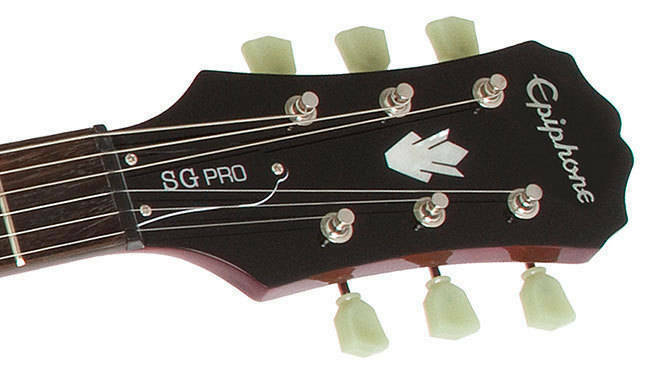 The truss rod cover is the classic Kalamazoo bell shape with SG PRO in white. Alnico Classic PRO Power: Epiphone always finds a way to make improvements on our classic designs and the G-400 PRO is no exception. Now featuring Epiphone Alnico Classic PRO 4-wire humbuckers in the neck and bridge positions, the G-400 PRO offers a tonal palette that far exceeds any other guitar of its kind. The Alnico Classic PROs feature Alnico V magnets for terrific humbucker sustain with a huge dynamic range that can go from clean to crunch at a touch. And now, the G-400 PRO features coil-tapping on both pickups via a push/pull control on the pickups' volume controls. Epiphone Hardware You Can Trust: Epiphone leads the way in manufacturing great-sounding guitars for players of all levels and that goes for our great hardware, too. Epiphone provides quality, all-metal hardware on all its instruments including full-function volume and tone knobs using full-size 500K potentiometers matched with Epiphone's rugged, all-metal, 3-way toggle pickup selector switch for long-lasting performance. The G-400 PRO features our famous LockTone bridge and Stopbar tailpiece which yields incredible sustain along with Wilkinson Vintage Classic 14:1 tuners for lifetime security. 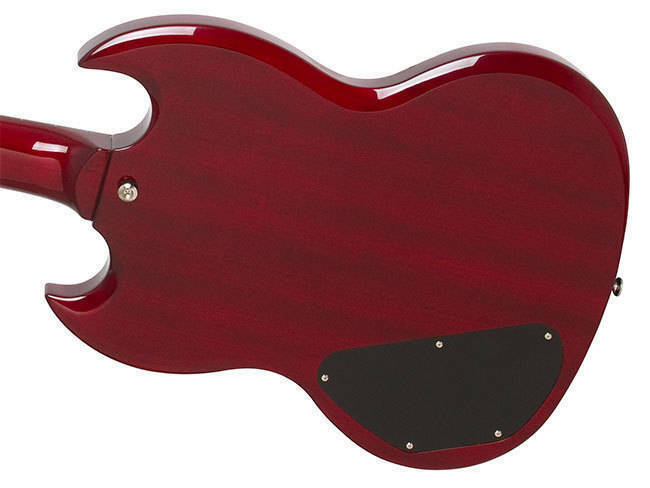 The G-400 PRO comes in classic Cherry (CH) or Ebony (EB) finish. Left-handed models are available in Cherry (CH). I haven't played in over 20yrs and just bought this guitar yesterday and i'm very satisfied with it. I recommend buying one for the value and it sounds great too. I have to admit I bought one on a whim, but wasn't disappointed-I noticed immediately that its construction was very solid, despite having such a lovely eye-catching appearance in the original-SG burgundy red, which I admit swayed me, but I found that it's actually a real guitar underneath. The body, the bridge, the neck and even the control pots right down to the humbucking pickups are all very nice, and how L&M can put these on sale and still make a profit escapes me. So compared with a Gibson SG.. it felt just a little bit clunky and the strings maybe didn't feel quite as 'live', but if you don't have several times the cash to burn this will definitly fit the bill, and easily make a great choice for a first electric, then become a back-up guitar (you want to change a string when you're playing in a show??) and later on you can sacrifice it on stage when you're a rock god! I've bought the Gibson SG Standard T (2017) so I could do a comparison between these two guitars. And my goodness, this Epiphone is an EXCELLENT guitar, it can go on par with my Gibson. Please please PLEASE do not hesitate to buy this, and don't let the Epiphone name on the headstock fool you, it is an amazing guitar, I highly recommend you pick it up. I tried it and its AMAZING!!!!!! I recently bought this guitar. I love it. 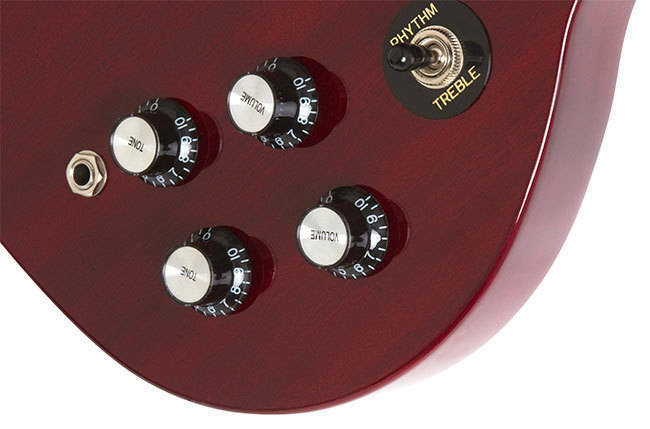 The finish is gorgeous in red (you can see the nice wood grain through the finish), the action is great, the tone is beautiful and it has awesome versatility overall. I owed lots of instruments, and I can guarantee that it's a great value. -I bought an amp as well, so I did financing, and I must say, L and M's financing options are also fantastic. I've been playing guitar for almost 20 years and have owned a variety of different instruments. I was recently in the market for a new electric guitar and wanted a SG as I had a chance of playing one a few years ago and really liked it. I didn't feel like paying the big name pricetag so I went with the much cheaper Epiphone version and I am glad I did. The guitar is built very well and is flawless. Originally I was worried about what the pick ups would sound like and wanted to order a set of EMG's alongside the guitar but there is no need. The pick ups sound fantastic both clean and distorted and the coil tapping option is great. I play mostly metal and this guitar delivers. Overall this is a well built and great sounding guitar that is worth every penny. Can't recommend it enough. This is an amazing starting guitar for the low price this is a steal. Just change the pickups and the tuning knobs and you have yourself an amazing gigging guitar! I asked for this guitar for Christmas (assuming I probably wouldn't get it). It was a bit of a gamble for me, as I wasn't sure how a cheaper version of a better but very pricey guitar would be. Obviously, I did get it, and let me just say it is AMAZING. I play rock and metal, and this suits my needs PERFECTLY. The build quality is great, the pickups sound wonderful, and it's easy to glide across the strings (assuming they're nice and clean). I would highly recommend this guitar, not just as a budget guitar, but as a guitar you wouldn't be afraid to play, and sound amazing while doing so. Got this guitar almost 4 years ago and it still sounds great. Never had any real problems except having to tighten the strap buttons every so often. Overall an excellent guitar for the price! I have played this many times, and I have to say, this has the feel of a classic sg for what I like to call the "epiphone made up the sg, and gibson charges way to much price" price. I would love an sg, and this has great value for price. This is a glue neck so the upper fret access is great and I am an angus young/ac/dc fan, so I am all in!